To service the growing need for efficient, reliable data communication in a harsh environment of utility substations and industrial facilities, has developed a 1200bps modem that can operate from various AC/DC power supplies and survive high surge levels and extreme heat and cold. All this without compromising the performance expected from state-of-art communications devices. With the rapid move toward “intelligent” substation, where meters relays, RTU’s, SCADA system, etc are able to “talk” to remote operator, communication devices such as modems moving off the desktop and into the field, where the convenience of 115VAC power outlets and climate control are usually hard to find. Data Connect Enterprise has addressed this problem by developing the Powerport MIU202T series modem designed specifically for harsh environments. The Powerport MIU202T series modem highly sophisticated full-duplex, V.32bis data modem that designed to interface with RS232, RS485 (external device), 5V logic (TTL) or simple send and receive signals. The MIU Powerport 202T series modem operates on a 2 or 4-Wire Leased Line and Short Haul Systems. Private line distance is up to 5 miles. 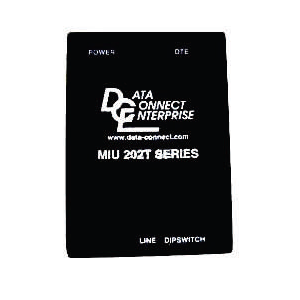 The Powerport MIU202T series modem is powered from a unique power supply that enables it to operate on any AC or DC voltage ranging from 48V to 240V. A low voltage version (9-36VDC) is also available. The Powerport MIU202T modem is designed to work in temperature from 40°C to 85°C and is surge protected on both the power and analogs lines. The Powerport MIU202T series modem is bundled in 5-3/8” x 1-3/8” non-metallic enclosures, suitable for desktop or wall mounting.